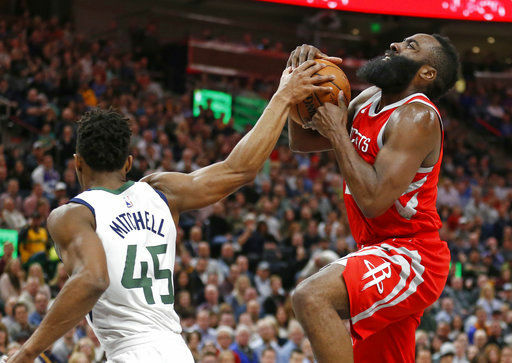 SALT LAKE CITY (AP) — James Harden had 26 points and Luc Mbah a Moute scored 15 of his 17 points in the fourth quarter to lift the Houston Rockets to their 13th straight win with a 96-85 victory over the Utah Jazz on Monday night. Playing the second game of a back-to-back set at high altitude, nothing seemed to come easy for the Rockets but the Jazz committed 22 turnovers, many of them unforced, to ease the pressure. The Jazz seemed determined to limit Harden and run the Rocket’s top shooters off the 3-point line but Mbah a Moute took advantage of open shots and lanes to the basket to keep the Jazz at bay. Mbah a Moute went 7-for-7 and Chris Paul added 15 points for the streaking Rockets, who trailed by as many as 15 in the first half. Coming in, it was a matchup of two of the hottest teams in the NBA. The Jazz had won 12 of 13 games but couldn’t find easy baskets against the Rockets scrambling defense. 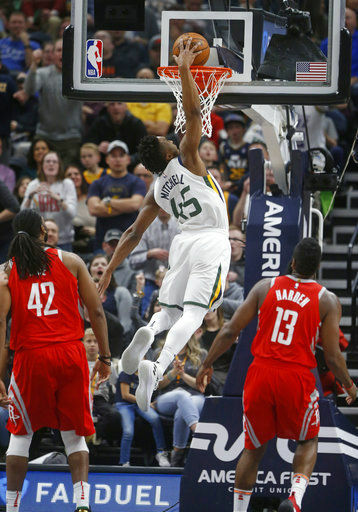 Rudy Gobert scored 17 and Donovan Mitchell had 16 to lead the Jazz, who were 7-of-29 from 3-point range – including the Jazz rookie who was 1-of-9. Rockets missed 15 of their first 17 3-pointers themselves but the cold spell didn’t last as Trevor Ariza hit back-to-back long balls to give the Rockets their first lead of the second half at 59-57. Stifling defense helped stretch that to a 77-65 advantage early in the final period with Harden on the bench for much of a 14-2 run. When Mitchell drove for a dunk with 4:30 left in the second quarter, the Jazz took their largest lead at 44-29. The Rockets won all four meetings with the Jazz this season by double digits. The contest began a stretch where the Rockets play six of seven on the road but Houston remains on a pace for the best record in franchise history even with a depleted roster. Ryan Anderson was out with a groin injury and Eric Gordon and Clint Capela missed the game with illness. Brandan Wright sat with a sore knee. 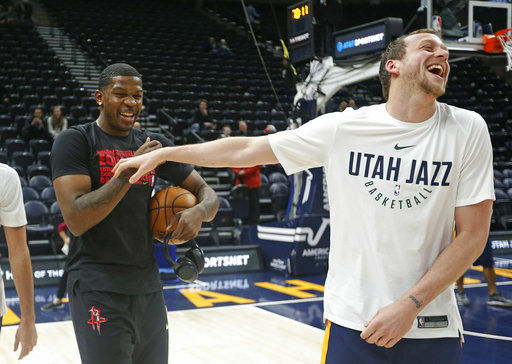 Rockets: Joe Johnson, who was traded by Utah at midseason and then signed with Houston, received applause when he entered the game in the first quarter. … Harden and Jae Crowder banged knees in the final minute of the second quarter. Harden rocked on his back and grimaced but then played the rest of the half. … The Rockets scored a season-low 39 points in the first half. Jazz: Backup PG missed his third straight game with a right ankle sprain. … As the first half came to an end, Joe Ingles and Harden hand fought, bumped and talked trash. Ingles, the NBA leader in 3-point percentage, missed four of his five of his attempts beyond the arc and scored 6 points. … The Jazz held the Rockets to fewer than 10 3-pointers for the first time since Oct. 23. Rockets: Visit the Los Angeles Clippers on Wednesday night. Jazz: Host the Minnesota Timberwolves on Friday night.